Due to increased global awareness generated by the activities of the Indigenous People of Biafra (IPOB) and the need to effectively harness the positive attention this has brought on the activities of our movement, we the family members of IPOB and it's leadership worldwide wish to proudly announce to the public the opening of our brand new official world administrative headquarters of the Indigenous People of Biafra by the Deputy Leader Uche Mefor and all members of the ruling Directorate of State (DOS) on the 8th and 9th of December 2017 in Langenfeld Germany. This ceremony will demonstrate the commitment and zeal of the worldwide family of IPOB to meet the administrative challenges of our renewed diplomatic offensive and demands of the upcoming mid-2018 independence referendum of the territory of Biafra. 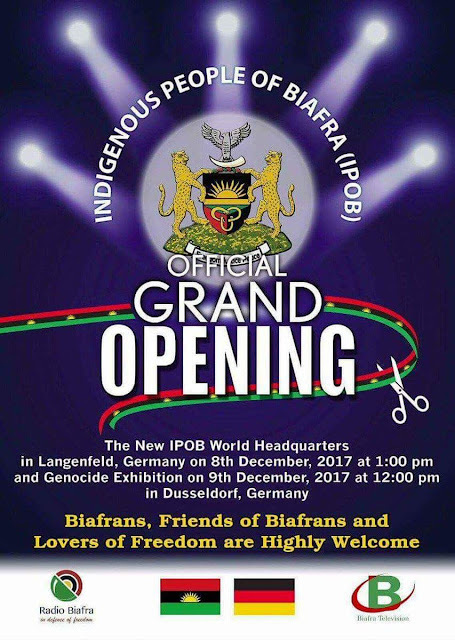 It will also serve as a notice to all friends and well wishers of Biafra that Langenfeld Germany is now the one and only officially recognised world headquarters of IPOB from which every authentic information regarding the agitation for Biafra liberation will emanate from. The public is hereby warned to desist from corresponding with any other office except the one in Langenfeld Germany. No distance can affect the work of our baphomet.